Many moons ago I took a job that my Dad had got me, shooting photos of Santa and the kids at David Jones. It was my first photo job (not for him) and it was my first job out of high school , it was the Christmas I finished actually. I was 17 and I remember lugging Dad's Nikon film cameras too and from DJ's on train and bus every morning and afternoon. At that time I was experiencing my first relationship with a boy and there was, of course, drama. There was a girl at David Jones who was there to look after the kids, keep them happy and distract them from their parents with squeaky toys and take everyone's details. Afterall, I couldn't leave the camera! She and I had many a moment free to discuss the drama of my first very loosely termed "relationship". A relationship that was more like a lots of late night talks, walks at the Cottesloe Civic Gardens, trips to the beach, house parties to celebrate the end of school and of course a fair bit of making out. She was brilliant, so cool with her colourful outfits, hot shoes and, of course, answers to all my 17yo boy problems. She was my first friend out of high school and when I was diagnosed with Coeliac Disease five years later she was the first person to jump on the net, read up on the disease and find an awesome recipe for brownies that she adapted gluten free , just in time for Pride & Predjudice day. In case you're wondering, this is a day where we'd all get together and sit on her couch and watch the entire BBC series of Pride and Predjudice, usually, with lots of magazines, cheese platters for lunch and in this years case a brownie that lasted until the opening credits. Yup. the opening credits. I think she had eaten half of it before we got there it was that good. Ever since it's been my standby brownie recipe. So, in honour of my gorgeous friend, Cat, who has always been there to talk boy stuff (even when that brieffling after high school ended after 5weeks, yeah I called it off, too much drama, not my style! ), to be the one support me when I decided to move interstate once again, help me by always cooking gluten free when she had friends over (yep, everything going into that dip had to be gluten free or else - her rules!) and now as I plan my big day with the man I love. To you Cat , thankyou for brownies and just being there. Baked in a flash it's a delicious, moreish, slightly but not too dense double chocolate and pecan studded brownie. I've made this recipe with the same base ingredients ever since that Pride & Prejudice day (that's 5years worth of gluten free brownies this December) simply switching up the original roasted hazelnuts to pecans this time round, but previously, I've added in half a cup each of frozen raspberries and white chocolate chips and sometimes it's half a cup of chunky chopped dark, milk and white chocolate. Whatever takes my fancy really. My fiance made it with dark chocolate chunks and chopped glace ginger recently. He took it to an event and it was polished off in moments. People were requesting the recipe and they didn't even know it was gluten free! I love those moments - don't you? *OR replace the hazelnuts with toasted pecans like I have in this recipe, or 100g dark, milk or white chocolate, roughly chopped, or 1/2cup frozen or fresh raspberries or berry of choice. Use your imagination there are many possibilities! Feeling festive? 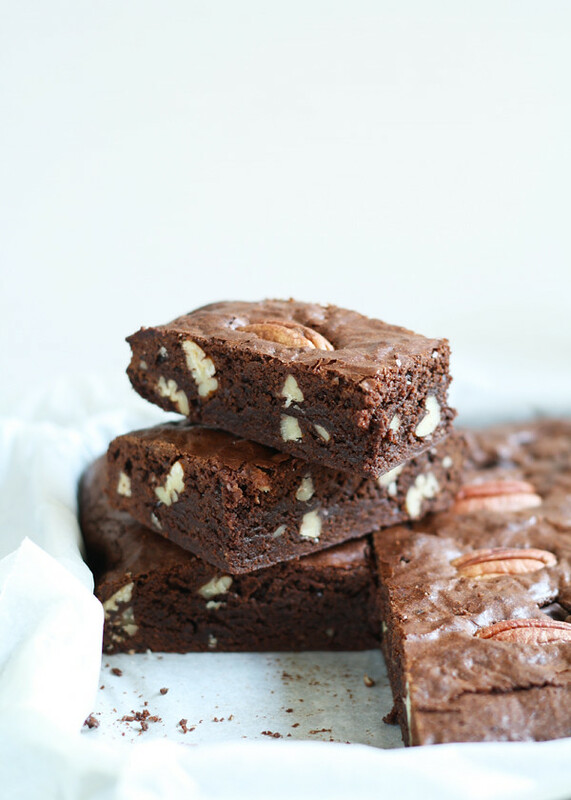 Check out the lush Christmas version of these brownies here. Preheat your oven to 180 degrees Celsius. Line a brownie tray (approx 28cm x 18cm) with baking paper. In a medium sized bowl whisk together thegluten free flour, cocoa and baking powder. Add in the hazelnuts and stir. Pour in the cooled melted chocolate mixture and the whisked eggs. Stir until just combined. You don't want to over mix it as this will result in a chewy brownie. 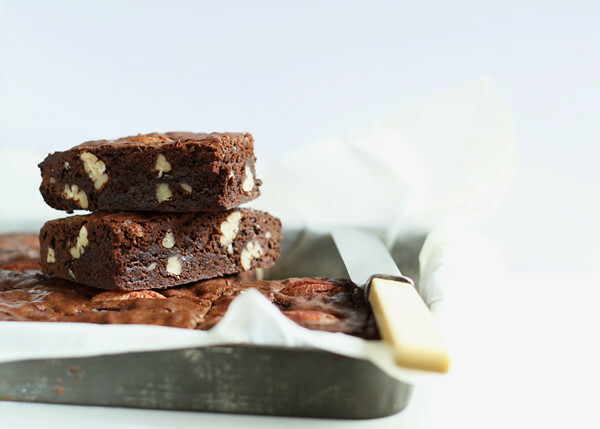 Pour into the prepared brownie tray and bake for approximately 30minutes. You want a skewer inserted to come out with a little mixture on, or you'll have dry brownies once they've cooled. Allow to cool a little. Serve warm with ice cream or cream. A little caramel or chocolate sauce drizzled on top it isn't half bad either..
Best enjoyed with friend, preferably straight out of the baking tray with multiple spoons.